If you are of moderate weight and height, these cheaper treadmills may be good for you. We strongly recommend that you checkout our Best Treadmills under $1000 which has some of our best rated models with stronger motors, powered incline, longer running deck, better warranties, and much better build quality. Treadmills provide an excellent form of aerobic exercise at home that you can do no matter what the weather is outside. Treadmills are easier on sensitive joints like the knees and hips, as most treadmill running areas are padded. You can compare each treadmill below by features such as motor horsepower, maximum weight capacity, maximum speed, and more. A glossary of terms is available at the bottom of this page. The Nautilus T618 is an excellent heavy duty treadmill under $1500. If you upgrade to the T618, you will get a treadmill with a more powerful 3.5 hp continuous duty motor, larger running deck (20 x 60″), higher weight limit (350 lbs. ), better cushioning, 26 workout programs, built-in speakers & cooling fan, and a long warranty. The T618 has received outstanding reviews. 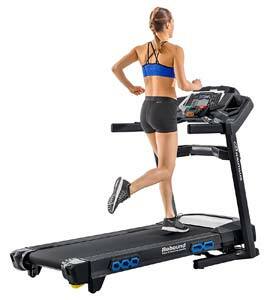 Folding Treadmill = There are two type of treadmills. Folding and Fixed. A folding treadmills can fold up and roll away to another spot for easy storage. Then there are fixed treadmills, which once assembled usually stay in the same spot and do not fold up. Motor Horsepower (HP) = Horsepower or HP is a measure of power. All else being equal, a more powerful motor is better as it will strain less under heavy load (and last longer). The heavier you are, the more horsepower you should get. Higher horsepower treadmills will cost more money, but the motor will generally last longer, so getting a more expensive model may be the best idea. Maximum User Weight = Each treadmill depending on its construction and horsepower of its motor has a maximum user weight limit. So if the limit is 300 lbs, and you are over 300 lbs., you should not buy this treadmill but look for one with a higher weight limit. If you weigh substantially less than the weight limit, this will put a lot less strain on the treadmill motor. Treadmills under $500 usually max out at 250-275lbs. If you weigh more, you will want to look at a more expensive treadmill. Incline Grade = This signifies the number of incline grades that this treadmill is capable of. Incline grades simulate walking or running up a hill. 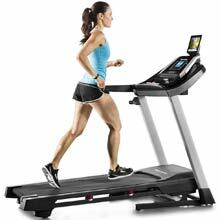 Many treadmills under $500 do not have powered incline, but have manual incline instead. Running Area = This is the running area or running deck area of the tread of the treadmill. Taller persons with longer strides may want a bigger running area. If you are a dedicated runner, get a running deck at least 60 inches long. These are usually seen in treadmills over $700. 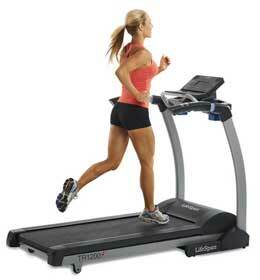 Treadmills under $500 have much smaller running surfaces than more expensive models.